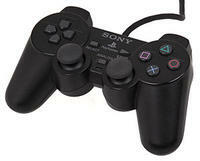 The Dualshock 2 analog controller can be switched to fully analog or digital modes, with the exception of the Start and Select buttons. Analog mode provides a pressure-sensitive function that, depending on the software, gives you precision control. The vibration function provides realistic feedback when supported by a software title.